The latest histologic study with CeraRoot implants has been done in the University of Minnesota, and the results confirm the excellent biocompatibility of the material with a direct contact between the implant and bone and no signs of inflammatory or foreign body reactions. Histologic study by the University of Minnesota. A major concern with ceramic implants is the fracture strength. In the past, there were some ceramic implant systems (alumina) that failed because the materials did not withstand the oral masticatory forces. Today the zirconia (Y-TZP) materials are much more stronger, and our supplier (TOSHO, Japan) is the world leader in producing this high quality zirconia powder according to the quality standards of ISO 13356. The CeraRoot zirconia implants have been placed in humans since 2003, and over 3000 units are now placed in Europe, USA, Canada, México, New Zealand, etc and there have not been any implant fractures reported. One of the key factors for this success is understanding the INDICATIONS and CONTRAINDICATIONS of the CeraRoot system. In this sense, if the patient does not have enough bone for the indicated CeraRoot implant then the area should be grafted before the implant placement to allow for the indicated implant. It is contraindicated to place narrow zirconia implants because the risk for fracture is highly increased. CeraRoot zirconia implants have a high strength and the diameter of implants are much greater and very similar to the natural teeth to be replaced. This is very important aspect because the zirconia material has poor bending properties compared to titanium implants, and thus the implant has to be weither to be safe enough. CeraRoot 12 implant is the smallest implant and should be placed only to restore lower incisors and upper lateral incisors. How strong are CeraRoot implants? See video of mechanical testing. CeraRoot products are produced and tested according to the highest quality standards and for this reason they have been approved in different markets. “…the gingival margin (GM) is located more coronally and Biologic Width (BW) dimensions are more similar to natural teeth around one-piece nonsubmerged implants compared to either two-piece nonsubmerged or two-piece submerged implants.” (Hermann JS et al. COIR 2001). Because the biology of the peri-implant tissues are very similar to the periodontal tissues, the same basic principles may apply. Today, it is globally accepted that to restore a natural tooth it is needed at least 3 mm of tooth structure above the bone in order to allow for enough space for the biologic width to create a sound barrier. 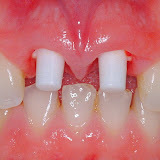 It is known that if this space is not respected it is very likely that the periodontal tissues will develop inflammation, and bleeding with a later bone remodeling and soft tissue recession. This is specially important in thin biotypes. Conventional titanium implants are placed in a way that don’t follow the rules of periodontal and restorative dentistry regarding the biologic width. The reason for that is that there would be an esthetic problem with titanium giving a grayness look of the soft tissues, specially in patients with thin biotype and tendency to recessions of soft tissue. 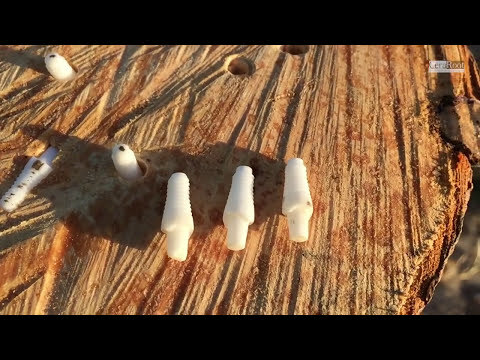 With the CeraRoot dental implants the principles and biologic concepts of the biologic width are fully respected because there are no subgingival gaps or connections. Therefore, restoring a CeraRoot implants is like restoring a natural tooth. Canullo L (J Periodontol 2010) reported that the Platform-switch approach around titanium implants may result in less bone remodeling than conventionally restored implants despite the presence of the same bacterial colonization. Nowadays most titanium implants are placed at bone level or even deep into the bone. This approach results in a very deep pocket around the implant crown that goes from the gum margin down to the implant level. This subgingival spaces are always colonized by anaerobic bacteria that produce bad smell. Because, the patient’s inmune system may be compromised over time (with the aging process, illness, stress, smoking…) the bacteria present in the micro-gaps may induce inflammation, bone loss and peri-implantitis. The long term prognosis of a dental implant in general depends on the peri-implant soft and hard tissue status. A healthy peri-implant tissue provides with a good barrier for the oral bacteria that is colonizing the sulcus around the implant. In natural dentition a periodontal sulcus of 1 to 3 mm is considered to be normal and the patient can easily maintain the hygiene over time. However, when there are deep sulcus or pockets around the teeth then there is an increased risk that the bacteria species colonizing the subgingival spaces may shift to more anaerobic and pathogenic. With conventional titanium implants the sulcus around the crowns are much more deeper than 3 mm. The deeper the implant into the bone, the deeper the sulcus will be. Once more, this is not good news in terms of risk for bacteria pothogeny whenever the patients overall health is compromised. Because CeraRoot implants develope a peri-implant apparatus very similar to the natural dentition, the long term peri-implant health is much easily maintained compared to conventional titanium implants. CeraRoot zirconia implants have been designed to replace missing or hopeless teeth in a biologic approach. The restorative approach for one-piece implants is to restore the crown at gum level or within the sulcus. The same way it is done in natural teeth. For this reason, CeraRoot implant system has 5 different designs in order to replace different teeth in the mouth with the best possible emergence profile, wich is given by the implant diameter and transmucosal part all in one implant body. 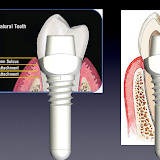 A “one-piece” implant is more similar to a “one-piece” tooth, compared to conventional titanium implants that have multiple parts that are connected to each other by means of screws. 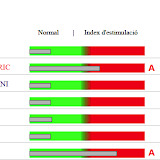 In general most patients do not have any metal sensitivity or allergy to conventional titanium implants. However, there is an increasing number of patients with a compromised inmune system that may be at risk to have or develop such sensitivity to titanium. CeraRoot zirconia implants are totally bioinert and thus there is no reaction between the implant and the patient’s inmune system. An interesting case report of a full mouth rehabilitation with Titanium allergy has been published in EJED (European Journal of Eshtetic Dentistry). Click to download. It is very much known that all the metals in the oral environment experience a certain degree of corrosion. This is very important when different metals are present in the mouth at the same like mercury amalgams, PFM crown and bridges, titanium implants, piercings and others. When different metals are present the corrosion is accelerated due to the galvanic effect. The saliva, temperature and fluoride play a key rol in the corrosion that most of the times occurs in a subclinical stage. However, in the patients with compromise inmune system, the metal corrosion may induce a metal sensitivity or allergy in the long term. The non corrosion of zirconia dental implants are a very good alternative to titanium implants and should be used as the gold standard treatment whenever it is possible and indicated. CeraRoot zirconia implants are very respectful with the periimplant tissues. For this reason a healthy and pink mucosa is much easier to achieve compared to regular titanium implants. Moreover the gum papillas are very well preserved due to the fact that there is minimal bone remodeling around the implant and the biologic with is much thicker and more coronally installed compared to conventional titanium implants. Quite often the patients with thin biotypes that have titanium implants present a grayness effect to the surrounding tissues. To avoid this anesthetic effect many implant sites are grafted and augmented with bone and soft tissue grafts. With the use of white zirconia implants the grafting procedures for esthetic reasons are not so often needed. Moreover, most dental technicians can provide an easier and faster esthetic crown with metal-free materials. Since the zirconia implant is white color it is even much more simple work. What would be the approximate cost for an Zirconia implant and Zirconia crown? I need to know this if this is affordable on my part..
And if I can afford the cost of it I certainly would go for it. I need to find Dentist in the country of Japan who uses Ceraroot.., are there any ?. I am a general dentist in Lawrence, Kansas. I have been placing implants for a couple of years now and really enjoying it. I have done some advanced procedures and multiple implant cases. I feel pretty comfortable in the implant design, procedure, and knowledge of the topic. Currently I am placing Zimmer implants.